This member of Indian team gets compared to Laakha of "Lagaan"
Hardik Pandya suffered a career threatening injury during 2018 Asia cup in the group stage game against arch-rivals Pakistan. The Baroda all-rounder has been out of action since then and made his comeback in the Ranji trophy game against Mumbai playing for Baroda, in December. Pandya went through rigorous rehabilitation in Mumbai to attain full fitness that brought him back into the Indian team for the last test match against Australia. Just when the things were set for his return on the field, his controversial comments on woman in the chat show Koffee with Karan meant that he was banned to play the game he grew up playing. He was called back to the country before the start of the ODI series against Australia. Pandya got criticized all over the country for his foul codmments but COA finally decided to provisionally lift his ban until the next hearing which meant that he was asked to join the team ahead of the 3rd ODI against New Zealand. Hardik Pandya looked determined to perform at Bay Oval in Tauranga. The 25-years-old showed his great acrobatics on the field and hung on to a stunner to send Kiwi skipper Kane Williamson to the change room. 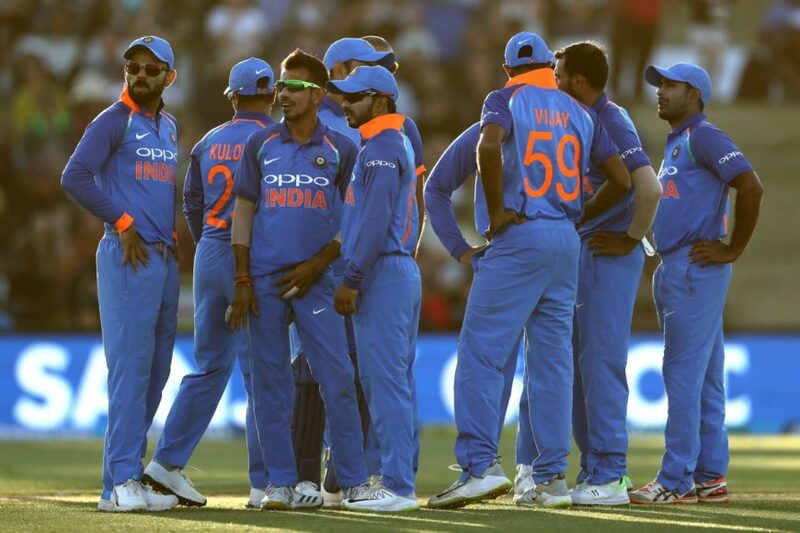 Pandya was fielding at mid wicket position in the 17th over of the first innings when Kane Williamson came down the track to take on Yuzvendra Chahal. The ball was flicked in the air and Pandya dived full stretch to his left to take a charmer. The wicket of Kiwi skipper proved to be a turning point in the game as his ability to bat through the course of 50-overs may have put India on the back foot. Pandya gained enough confidence from his fielding effort that clearly depicted in his bowling. He picked up two crucial wickets in the game by giving away just 45 runs in his quota of ten overs. 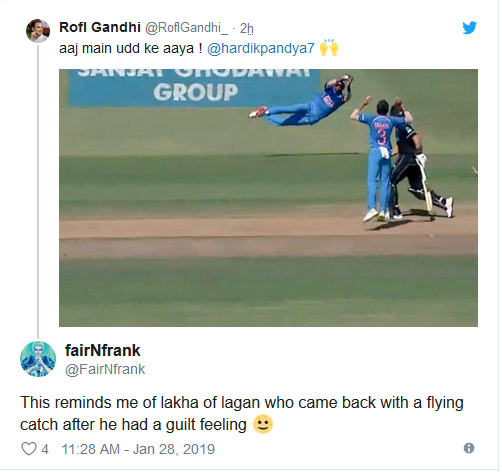 Some users on social media platform twitter even referred to him as Laakha of the iconic movie “Lagaan” after taking the unbelievable catch.